The Cape of Uppurui can be reached by climbing what looks like a few hundred stone steps to the skies, located between the residential area and the Daikouji-Temple in Hongo Village. The ‘Inari-Daimyoujin’ Shrine, known these days as ‘Inari- Jinja’ is familiarly known in Uppurui Town in Hongo as ‘Kozu Shrine’. The enshrined kami are of course the Inari god Ukano-Mitama-ookami’ along with ‘Saruta Hiko-no-kami and Ama-no-Uzume-no-ookami’. In a local community that makes its living mainly through the fishery industry, it would seem ‘Inari’ isn’t the ideal match but according to the shrine’s history, it was said to have been established after the Chief Priest received the Fushimi-Inari kami as a shared deity in 1824. However, ‘Inari Jinja’ can be found on the Forty-two Bay wood block scriptures dating back to 1710 which casts some suspicion over the authenticity of the official shrine history. It would seem that ‘Inari’ had been used for this shrine going back many years previously. ‘Nori-Shima Jinja’ found in the former hamlet of Funatsu has been relocated to the shrine grounds. It’s a shrine closely related to the local products such as Uppurui Seaweed so its festival is an occasion to ask for continued prosperity. 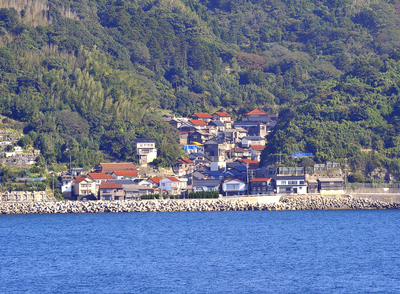 After the coastal road, walk up 100m along the main road from the village, then walk up another 27 stone steps and Uppurui Bay’s Kozu Shrine will be there in front of you. You’ll no doubt need to catch your breath before you make it to the shrine but rest assured the journey back will be almost unbelievably easy compared to the trek up there. To the right of the main hall, is the Torii gate of Nori-Shima Shrine where the god of Uppurui seaweed is enshrined. 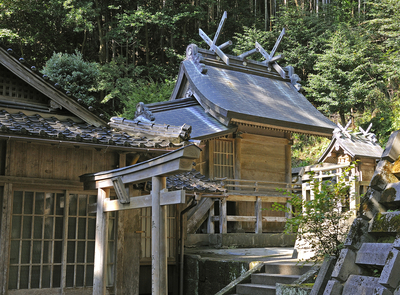 It is said that the original Nori-Shima was worshipped in a very small, basic shrine in the Hongu Funatsu village. ‘Uppurui-Nori (Seaweed) got its name from Uppurui Bay being known as the collecting place of seaweed, however in recent years it’s become known that collection is more likely to be done at Mitsu-Bay. It’s said that some people have lost their lives whilst gathering the nori when the rock faces rich in seaweed have been suddenly struck by dangerous waves. It is indeed a dark tale however; it’s a lesson to all that during winter only those with a professional knowledge of the waters should attempt to gather seaweed during its peak harvesting time. No doubt, one can feel celebratory being able to garnish their ‘O-Zoni’ (New Year’s soup) with Uppurui seaweed.